There is a clematis for every season, every aspect and every place. The flower size and colour range is also wider than you may imagine. Early Flowering Species like alpina or montana types. White – Marie Boisselot, Montana sericea, Armandii or Clematis chrysocoma. Red – Ville de Lyon, Madame Juklia Correvon or Ernest Markham. Yellow – Clematis tangutica, Moonlight, Ligusticifolia or Otto Froebel. Violet – Etoile Violette or Clematis alpina Francis Rivis. Blue – Ascotiensis, Macro petal Blue Bird or Multi Blue. Pink – Clematis montana Elizabeth, Bees Jubilee or Hagley Hybrid. White and purple Clematis florida Sieboldii. Soil for Clematis should not be too acidic but alkaline soil is fine. Impoverished soil near a wall or under a hedge should be improved with plenty of humus before planting. Sandy soil looses moisture quickly and also needs humus adding. All clematis will grow better if the roots are kept cool. Plant a bit deeper than the soil level in the pot where they were grown and cover the roots area with a tile, rock or mulch. Large flowered varieties will have stronger colours if the flowers grow in light shade. Use a good Foliar feed every 7-10 days and a good root drenching weekly. All clematis even the herbaceous varieties need some support. The easiest support is often other plants with matching characteristics – heather for small macropetala types or a tree for the more robust viticella varieties. Walls are fine as long as the mortar and brickwork is sound for a network of wire. Clematis montana can cover a large wall quickly. Trellis itself needs to be securely attached to battens but can be attractive when cloaked in Clematis or on it’s own in winter. Archways, tripods and obelisks look great when covered with a climber such as clematis. Similarly pergolas can have both climbing roses and clematis co-existing. Try a pillar made from a length of Oak or hardwood to train your clematis because you are bound to want to grow more once you start. Clematis urophylla ‘Winter Beauty’ also known as Old Man’s Beard flowers is a superb evergreen clematis bears its delicately fragrant, waxy, bell-shaped flowers in the depths of winter. The foliage is so lush, that you’ll think its summertime all year round! Plant Clematis ‘Winter Beauty’ against a warm house wall so that you can appreciate its winter flowers from your window. This sought after variety will appreciate a sheltered site with some winter protection. Clematis ‘Bill MacKenzie’ really couldn’t be easier. Watch it scramble over fences, covering unsightly sheds with ease. From midsummer this versatile climber is covered in small canary yellow blooms, which give way to large fluffy seedheads for an attractive autumn display. Clematis ‘Crystal Fountain’™ are quite extraordinary.A fountain of crystal-blue stamens radiate from the centres of the dazzling blue, 15cm (6”) wide blooms. Terrifically floriferous, this clematis continues to bloom throughout summer and into early autumn. It’s compact habit makes it ideal for containers and small gardens. Clematis armandii flowers in spring with exquisitely fragrant, star-shaped white blooms literally smother this beautiful evergreen clematis in spring. The new foliage emerges bronze tinted, gradually maturing to glossy dark green that will quickly cover walls and fences within a few years. Best suited to a sheltered position, this vigorous clematis requires plenty of space to twine its long evergreen stems. Pot up small clematis plants and grow them on until large enough to plant in their final positions. When planting clematis, choose a position in sun or semi-shade and plant the climber deeply in moist, fertile, well drained soil. Position the top of the rootball at a depth of at least 3″ below soil level to encourage new shoots to form from the base of the plant and prevent wilt. Clematis dislike soils that are particularly wet or dry. Soil can be improved by the addition of plenty of well rotted manure or garden compost. 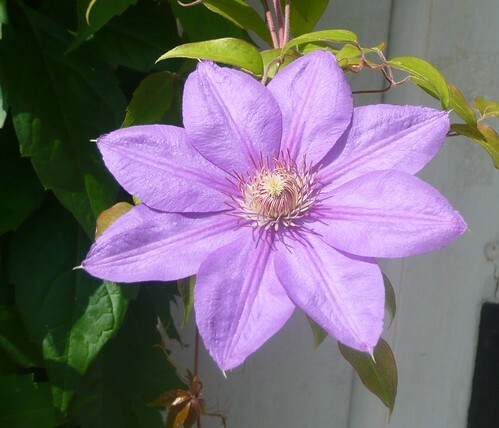 Train clematis plants onto a suitable support such as trellis, wires or a freestanding climbing frame.